The Poem Farm: Day 11 - National Poetry Month 2015 - Sing That Poem! Day 11 - National Poetry Month 2015 - Sing That Poem! Welcome to Day 11 of this Year's Poem Farm Project! Yesterday's poem was City Home. Here is the tune that goes along with it, below. Did you figure it out? Here are our friends from Margaret Simon's class at Jefferson Island Road Elementary in New Iberia, Louisiana. They got it! As always, I welcome you to share your SoundCloud (easy free app) recording with me via e-mail, and I will be happy to include your voices here too. Hint - Both stanzas of this poem are written to the syllable and meter count of the first verse of today's selected song. I repeat the pattern of the first verse twice rather than changing it in verse/stanza two. Students - One can never know where a poem will come from. I often say that I like to trace a poem's family tree back in time, to figure out its roots, where it came from. Today's poem came from a conversation. On Thursday at Arcade Elementary, I was eating lunch in between assemblies, when a lady who works at the school walked into the empty-except-for-me auditorium. She was looking at my puppets and books, and I said, "Hello." She said "Hello" back and stayed to chat for a while. During this warm chat, I learned that my new friend adores lighthouses. She likes them so much, in fact, that she stops at lighthouses on her travels and asks to speak to the lighthouse keepers. Then she writes down what she learns about the different lighthouses. She has many stories and has met many interesting people this way. In fact, one keeper even offered to sell her the lighthouse! I loved talking with someone new this week, and it is clear that I kept our conversation in my mind. That conversation came out in today's poemsong. It is funny how sometimes I will not hear a word for many weeks or months and then, suddenly, I hear it over and over. After talking with my new friend about lighthouses, on Friday I found this great NY TIMES parenting article about "lighthouse parenting." Clearly, I was meant to write about a lighthouse for today. Lighthouses are following me! Pay close attention to the images and words and sounds that seem to be recurring in your own life. Any one of these might give you an idea to write about. What is following you? Remember - it is National Poetry Month, and you can learn about poetry happenings all around the Kidlitosphere, all month long, at Jama's Alphabet Soup. My such word of the week is "spread-eagled"--how about that? I'm having a LOT of fun with this challenge, Amy, and enjoying hearing the kids play with it too. I've gotten them all right so far except for "Greefee Wumpa," which fooled me. But it's not really getting easier, which surprises me! Thanks for all the hard work to set this up! For our upcoming trip to DC & the Chesapeake Bay area, one of the students is in charge of researching the lighthouses there. You're so right, Amy, you never know when a topic will appear, & then again! One of my fondest dreams is to stay in a lighthouse-wouldn't that be fun? 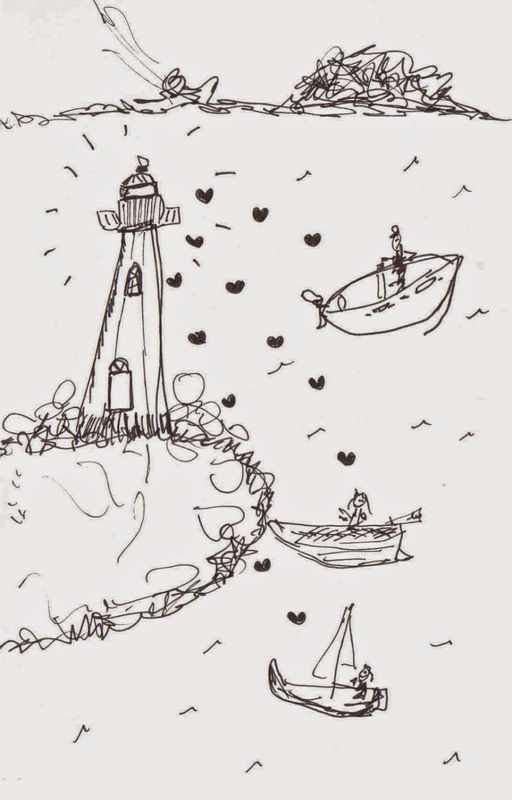 Love this idea of a lighthouse's 'boat friends'. The stories of long ago seem so adventurous to me. (I think I guessed the song.) Thanks for doing this-always fun!